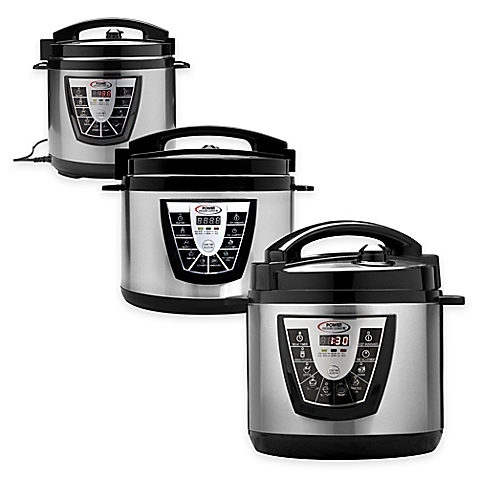 Ninja VS Power Pressure Cooker XL- Which is for you? (Yes the one you see in those commercials)! If asked, I would tell you that I would have both if I had the counter space and the money to buy another Ninja! I have decided to give you a good pro/con list between the two! I am sure you are saying; did you just say your next SLOW cooker is a PRESSURE cooker? It’s easy! The Power Pressure Cooker XL is so much more than just a pressure cooker, it is an Oven, Stove Top, Slow Cooker, Rice Cooker and a Pressure cooker! I feared pressure cookers before getting this one because I had heard that they could be dangerous, and I tell you if you put enough liquid in (Tomato Sauce mixed with some water, Beef/Chicken broth, or just plain water) you will be just fine! 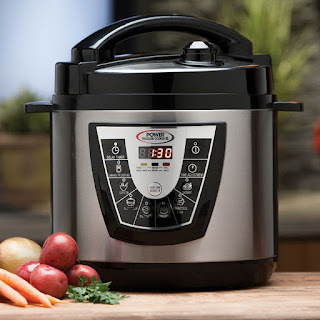 The slow cooker function is just like any other slow cooker and doesn’t need the water to work properly! You can brown stuff using the stove top feature (Just push the meat button without putting the lid on) and you can use that to brown it and then push cancel and then put the lid on and push the slow cooker button and change the hours to which one you want to set it to! You may ask why I would want both, this one sounds like you would never have to buy another one! I don’t like the fact that the removeable pot doesn’t have a lid so it isn’t as easy as just putting it in the fridge and putting the left overs back into the slow cooker the next day, but that is the only complaint I have! I will write out the pros/cons now. 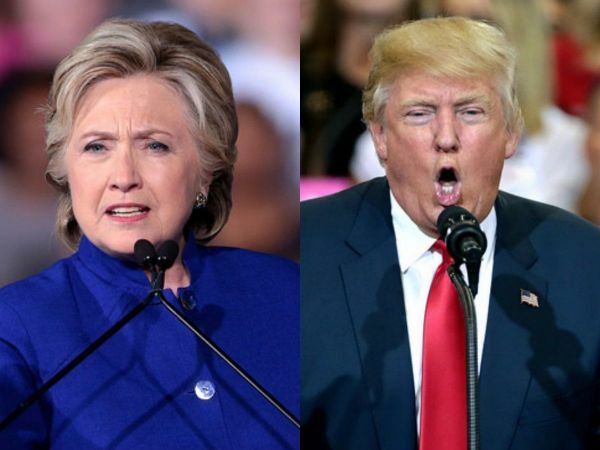 Trump VS Hillary- The Results are IN! This might be a post that might ruffle some feathers, and while I do try not to ruffle feathers anything political will always ruffle feathers. Do you know why politics are banned on many different groups on Facebook? It’s because so many people get offended when they post stuff about a candidate that they don’t like or agree with. This gives me some hope for our country, but why you may ask? Do you see people throwing a fit over someone buying name brand over generics? No, it’s because it’s not something they worry too much about or it is something that doesn’t matter. The main reason so many get up into arms about politics is because we care about what happens to our country and how it may affect us and the ones we love! 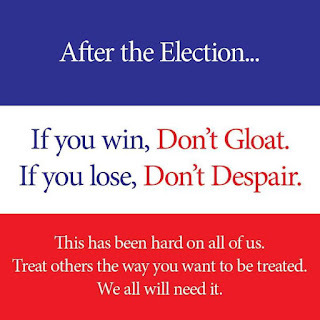 This is what I love about America and this is what I must tell myself as I work through the disappointment and fear that this election has left. 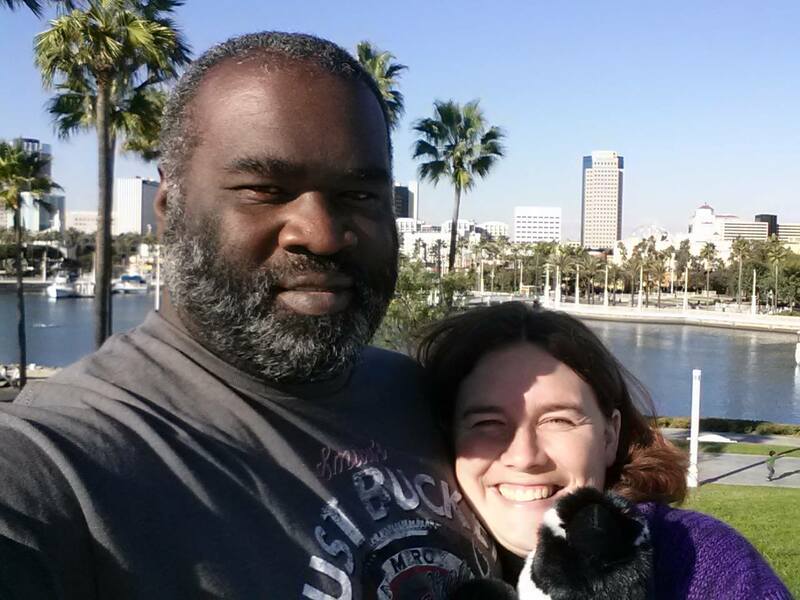 As everyone knows, my husband is on dialysis with kidney failure. He receives SSDI from social security and thankfully can get top notch insurance thanks to the funding from the American Kidney fund! 8 years ago, he could have been denied coverage due to a pre-existing condition, but now in 2016 he can get it without any questions about his health! I am not here to change your mind, or shame you for who you voted for! I am here to get my thoughts and feelings out in the open and hope that my post might help someone out there who is struggling with this turn of events. When I first found out Trump was running for president I thought it was a joke, but obviously the farther and farther it went I realized that it wasn’t and that I had to accept that he ultimately was the Republicans choice in candidate. I am not a Trump fan, never have been and I pray that he will prove me wrong like I have said so many times on my personal Facebook. I have seen so many posts about Obamacare and how it is ruining so many people’s lives and that there are no benefits from it. Do you know what it is like to have a life-threatening disease and be told that you don’t qualify for insurance because of that? The irony is this disease was brought on from an infection caused from a medical procedure done on his knee 15 years ago, it wasn’t even caused by diabetes or genetics! I am not saying that there are people that got kidney disease because they didn’t take care of themselves, I just feel it is ironic that a once healthy man with only knee problems got kidney failure from the lack of care from a physician and now, if Obamacare is overturned, he could face being without insurance due to it! I am also concerned that if Trump doesn’t focus on Social Security that, that will run out and then that will lead to a lot of stress on not only my family but many families of people with disabilities not just kidney failure as well as seniors! I feel that this country electoral system is very corrupt and that is what lead us to where we are right now, or even where we were in the whole process! It left us with the choice of who scares you more, and it should be who you agree with more as far as their policies and how they will run this nation and represent this nation! This morning I woke up sick to my stomach with fear and full with anger that I didn’t know how to deal with. I dropped off Elizabeth and went to breakfast with my husband and after going over my fears with him I finally figured out a worst-case scenario that I could live with. I have realized that as a woman of faith I need to rely on God. God has lead us here, whether he is leading us TOO something or FROM something, I am not sure, but I know that he doesn’t give us more than what we can handle and so I must rely on him. I have found a few versus that have helped me take a deep breath and lay it all on him. I understand you may not be religious or have faith in a higher power. I urge you to find something you can believe in! I am not here to pressure you into Christianity, I just want to share with you what I have found that helps me get through this painful and confusing time in my life. I urge you, please treat people with respect even if they don't agree with you. We are all in this together! We are the UNITED states of America! The best thing we can do for our country is to find unity, so that we can find what works for our country and not just part of it! So I leave you with this picture that has been circulating around Facebook. 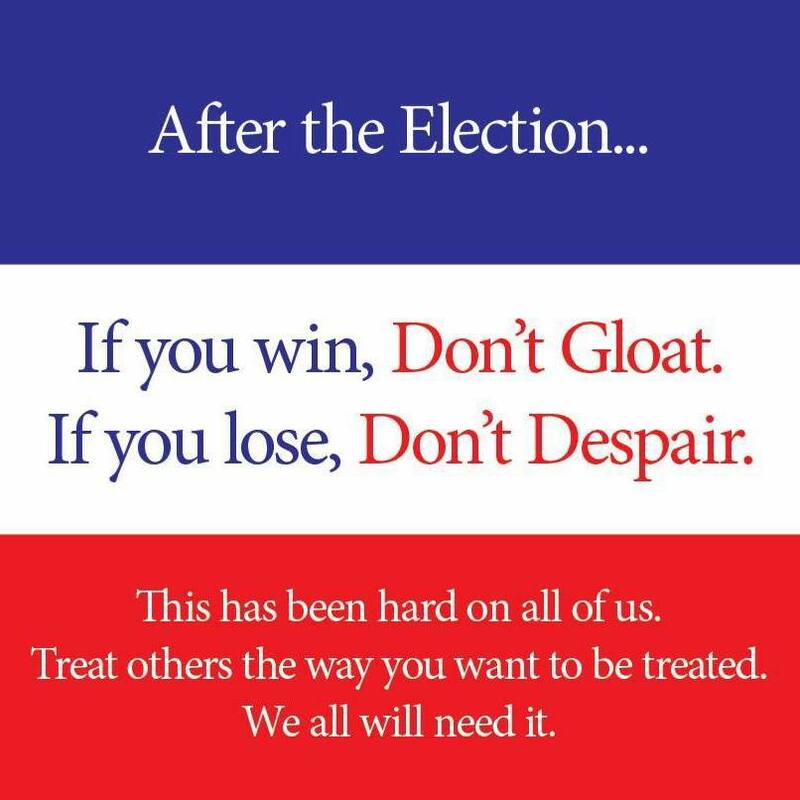 Please be respectful, but also find a way to figure out a way to cope with the results of this election! Many people are not having a hard time because they lost, but because this election has left them living in fear of the future and I want you to be conscientious about that! 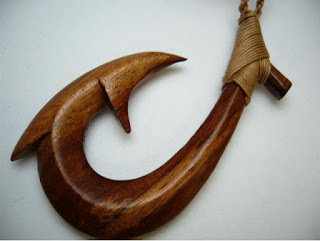 When my step daughter went to Hawaii last week she brought back with her a necklace that was a fish hook. She said that in Hawaii it was supposed to represent the provider. I felt that described my husband very well. He is and has always been the provider for our family. I want to share with you about the man that I call my husband. My husband was born in Virginia on December 19,1973, even though the social security office thinks he was born in 1974. He was the 3rd child of 5. He has 1 older brother, an older sister and 2 younger brothers. His child was very eventful, he lived to the fullest with his siblings! His father was serving in the US. Navy and so when he was only 3 months old they made the move from Virginia to sunny San Diego CA! His family would eventually move to “The city in the Country” or Poway, CA. This little city was northeast of the city of San Diego but in the same county. He has shared with me many stories about how it used to be exactly as the motto says, the city was nothing like you would think would be a place in San Diego! It was the paradise for the people who loved the country living without moving far away from city life! He was a wrestler in High School and I am told he was a very good one, his name even ended up in the San Diego Hall of Champions! He eventually graduated high school, got married and had 2 beautiful children, Liliana and Marcus. After about 19 years, his ex and him decided that they were better as friends and they chose to go their separate ways but stayed amicable for the kids. 2 years later I got hired on at Walmart where he was an assistant manager and we met. We started off as friends, but slowly it started to change and I fell in love with him. January of 2012 We became official and January of 2013 we moved in together. He has always been an independent man, do things himself and didn’t like to ask for help. When he got diagnosed with kidney disease it was tough. He had a wife and a daughter that both wanted to take care of him, and that caused some drama at home. Things at home started to calm down the more used to dialysis we got. We started to get into a routine and it became easier until we realized that the type of dialysis he chose wasn’t the right fit for him. We realized that to switch he needed to have a AV Fistula (Arteriovenous Fistula) placed so we made our way to the surgeons’ office and then we scheduled the surgery. The day before the surgery we got a call from the hospital stating that we would be required to pay close to $10,000 to have the surgery done. We couldn’t afford that type of money so we postponed the surgery until we could figure it out. Finally, we figured out insurance and he went in for his surgery. We knew that this would be the first of two surgeries. The second surgery was 6 weeks after the first and everything seemed fine. I couldn’t make it to the hospital due to me being at my externship for school. I decided to go pick up Elizabeth for him while on my lunch when I got a call from him saying I should pick up Elizabeth (He didn’t know I was already on my way) because he just started bleeding from his surgery site and he had called 911. I was freaked out, picked up Elizabeth and called my dad, since we lived with them at the time and he was the one with him, to see where they were at. The paramedics just checked his vitals and said that my dad would be able to drive him. He made it to the hospital and everything was fine, something just slipped inside the surgery site. His surgeon scheduled us the next day for him to go back in and clean stuff out. After that fiasco, everything went fine and he could begin training. Training consisted of him going to the dialysis clinic Monday-Friday to learn how to hook himself up successfully on his own. The first week it was the nurse who hooked him up while explaining what she was doing and slowly but surely through the next 3-4 weeks he learned how to do it without the help of the nurse. She also taught him troubleshooting as far as alarms on the machine and what to do in times of emergencies. After the training was up, the nurse visited our home on our first day of dialysis at home and was there to make sure we could do what was learned in the training, successfully at home. Luckily, even with the placement of his fistula he can pretty much do things on his own, just needs my help with the small stuff such as tape and throwing stuff away. Even though he is considered “disabled” and I am his Caregiver, even though he hates that term, I am thankful that I have a man that pushes past that and doesn’t fully rely on the help of his wife allowing me to be more of a wife than a caregiver. Dialysis, The things I missed! After a few days of exploring other aspects of our lives I would like to return to dialysis. There was a few things I hadn’t discussed as far as the differences in length of time and some other options as far as getting dialysis done. My husband is a bigger guy, I wouldn’t describe him as huge, but he is bigger built! When we started PD we were told it would be around 8 hours at night, so we were pretty shocked when 8 hours turned into 10 hours. The reason it was 10 hours instead of 8 is because he needed longer “Dwell” times. 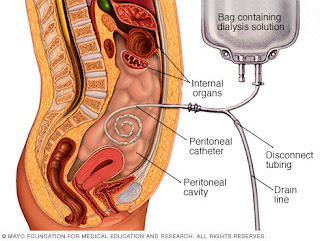 Dwell times is the length of time the fluid is left in the peritoneum! Peritoneum is described as “The peritoneum /ˌpɛrᵻtəˈniːəm/ is the serous membrane that forms the lining of the abdominal cavity ” I would like to say that I know exactly how long his dwell times were but I don’t remember but I believe it was around 1 hour 30 minutes with about 5-6 exchanges per treatment. Exchanges start when they fill your space with fluid, dwell time and ends when they drain the fluid. Weight has a big influence on how long of treatment you are expected to do. This is the same for PD and Hemo-dialysis (whether it is done in-center or at home). On my other post I had a comment about the person using the in-center machines at home. That was something I didn’t realize was an option. I would like to thank my viewers for making comments about some of the things that I had missed. One of the things that I had missed was that there is a nocturnal option as far as Hemo-dialysis in-center and at home. This is done while the patient is asleep and is a longer treatment time. The longer the treatment time, the easier it is on the patient as far as recovery and how they feel afterwards and the better the dialysis is. Not everyone can, or even wants to do nocturnal but it is a great option! Nocturnal is best for the patients that don’t move around a lot while asleep, this is the reason why we feel it isn’t a good option for my husband. I love that there are so many options as far as dialysis because it allows Kidney failure patients the freedom to choose what best fits their lifestyles, allows them to work if they choose to or if they must and it just makes it easier (not easy, but easier). I am sorry I haven't posted in a few days! I have been busy this weekend and I wanted to make sure that this post did it justice! How do I only spend $200 on food for the whole month? It truly is about planning, crock pot meals and knowing what is on sale! I utilize the Flipp app to help me out with knowing what is on sale, and how much I should be spending on food. This also helps if I write down the lowest price so if I find it cheaper at a store I am at I can feel confident that I am getting a good price! I try to stick with the same meat meals. This month it was chicken and I found chicken breasts (Bone in) for .99 per pound! I first start off with figuring out how many breakfasts, lunches and dinners I must plan for and go from there. We get paid the 1st of the month, 3rd and 4th Wednesday so there is a nice chunk of time from the 1st of the month to the 3rd Wednesday, so it is important that we plan for those so we don’t run out of food and starve! I figured that from 10/19/2015-11/16/2016 there was 4 weeks or 28 days! So, 28 breakfasts, 28 lunches and 28 dinners! We don’t typically eat breakfast, by the time we get Elizabeth up, to school for breakfast and walked to class and home we usually are on lunch time so I planned for only doing breakfasts on the weekends and lunches on the weekdays so that save me about 20 breakfasts that I needed to worry about but cereal isn’t that expensive if you must do breakfasts in the morning! Or even eggs! I planned for us to do meal preps for lunches so I found 2 recipes for meal preps and multiplies both by 2 to equal 20 lunches (for the weekdays) and then figured out what we should do for lunches during the weekdays which is typically microwavable stuff so I chose burritos! I planned for 8 breakfasts and a total of 28 dinners. I always try to find an easy and quick thing to make just in case we forget a frozen slow cooker meal! I will usually do about 4 dinners being spaghetti, I did 2 dinners being hamburgers, and then I divided the rest of the dinners needed (22) and so I found 11 slow cooker meals, doubled it and found meals that had little ingredients needed or cheap ingredients needed! Dinner: I mainly choose slow cooker meals like I said before. I chose whole chickens! Pot Roast (Easy, just get the pot roast, potatoes, onions and carrots and put some chicken or beef broth in)! Honey Sesame Chicken, Cilantro Lime Chicken, spaghetti, hamburger and pizzas! From previous shopping adventures and meal adventures I found that you could make stuff where you shred the chicken, such as soups and such, and have leftovers that you could use for lunch the next day or even for dinner again! That was another way that I would save money is make enough for leftovers and just reheat the next dinner which would mean you are making less dinners per month! I like to say that I only cook Dinner once a month! I create a list; I shop that list and then I put each recipe into a Ziploc freezer bag and put them into the freezer! When I am ready to make that meal, I pull it out the night before and I put it in the slow cooker that morning and it is ready by dinner time! I have started doing this for our lunches, but I make them every Sunday and then put them in the fridge to just microwave each day! It works well and it saves on dishes because you just have plates/bowls, silverware, cups and the slow cooker pot! 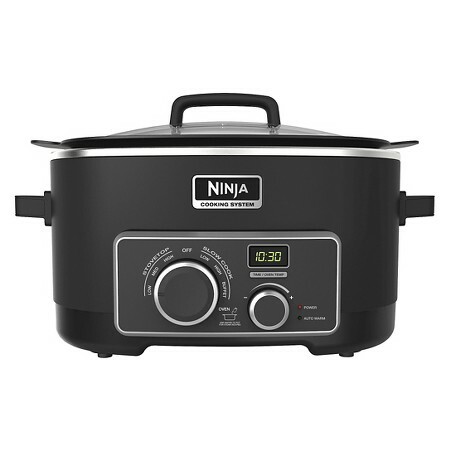 We used to use the Ninja slow cooker and so I will be doing another post to compare the 2 and share with you the pros and cons! :) Check back! I will have that up within the next few days!! and it basically does the same as hemodialysis but instead of a man-made membrane, it uses your natural membrane that you have in your body. This type is usually every night, usually about 8 hours at night but for my husband it was 10 hours at night, if you are using the machine. 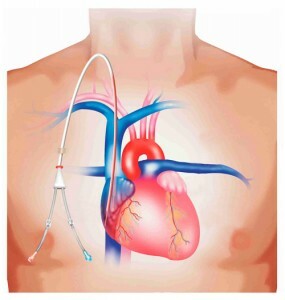 The 2nd type is not using a machine but manually doing exchanges, where you hang a bag of dialysis fluid, attach it to your catheter and then drain what fluid you have in your body (if you have any, some patients carry fluid around during the day, while some others don’t) and then you fill it back up using the force of gravity. This is done periodically throughout the day, usually taking 30-40 minutes to get hooked up and complete the exchange, usually done 4-5 times throughout the day. The nice thing about having the ability to do the manual exchanges is if the power goes out you still can do your dialysis. All 3 modalities work, of course if it didn’t they wouldn’t offer it! The real choice is which one works best for the patient and their life style! My personal opinion is that PD is great for someone who is smaller because they will have a shorter treatment time in the evening who works during the day. HHD is great for someone who works during the day and can hook up after work. In center is hard for some people because you have a select time of day, and select days (usually Mon/Wed/Fri or Tues/Thur/Sat) and you must work your schedule around that. We went through all 3 modalities before we ended up selecting the one that works best for us and for him! I hope that this post helps someone out in their decision of which modality to choose from! I will also be doing another post about what types of things decide your time on the machines as well as other options you have on top of the type of modality! This post might come at a different time because I want to start doing posts about other things happening in our lives! If you have any questions, don’t hesitate to ask in the question section! 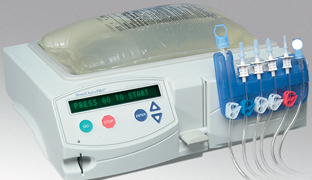 Dialysis. When everyone hears that word, the first thing that pops up in their mind is Hemodialysis. This is where blood is taken out of the body, filtered, and then returned to the body. But did you know that there are 3 different types of modalities? 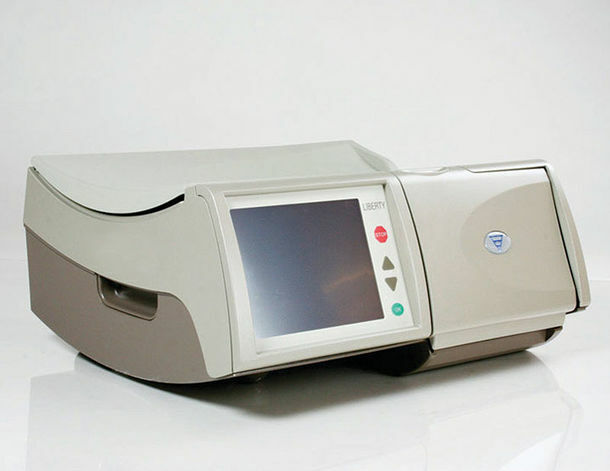 Modalities are the different types of dialysis, well when we are talking about dialysis! Modality is simply defined as “A particular mode in which something exists or is experienced or expressed”. 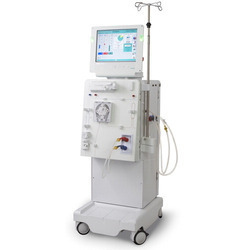 Home Hemodialysis has 2 types of machines and they are focused on you as a person rather than how well they dialyze. This one is for the patients that enjoy traveling. This machine you can take along with you. 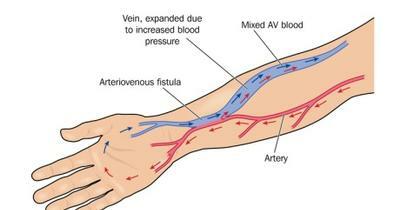 Home Hemodialysis takes about 2-5 hours for about 5 days a week. You can choose to do 5 days a week with 2 days off, 2 days on/1 day off, or 6 days on/1 day off. The more days you do, the shorter your treatment is. My husband does 5 days on/ 2 days off (Not consecutively) at 3 hours 4 minutes. This works well for us because neither of us work so we can select whatever time of day is best for what is going on that day. I will go over the 3rd type of dialysis in a later post. I didn't want to create a huge blog post that was so full of information. Again, if you have any questions don't hesitate to ask in the comment section!